We searched all throughout the area of the modular where the middle school and high school students meet. And while we must have searched for ten minutes, it seemed much longer. Several of us searched with the intensity of a parent who truly understands the meaning and importance of the mother’s words. After one of the volunteers went to a store in search of a children’s Bible, a father quickly came forward with two of them. While it’s pure speculation on my part, I believe he may soon be replacing a couple of Bibles that belonged to his daughters, though I cannot say for sure. With the gift of Bibles came tears of joy. Tears from the mother, as well as from many of the volunteers around her. 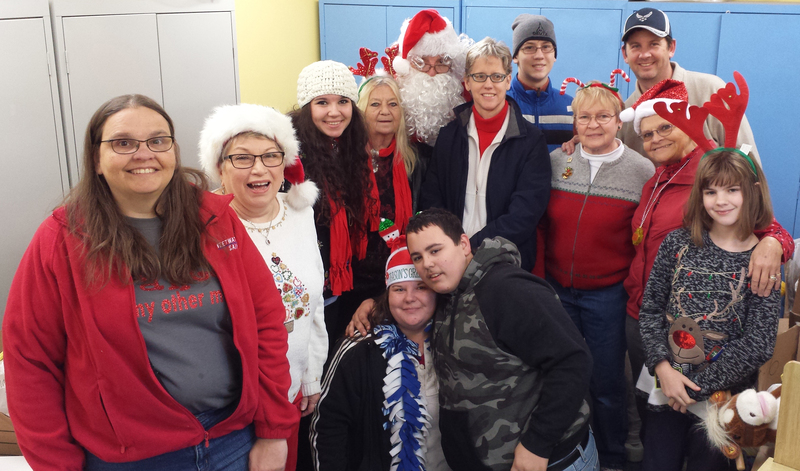 There were fourteen of us volunteering to assist families in need with toys for their children. Much of the heavy lifting took place long before I arrived with my family this morning, with generous donations, and tireless coordination from volunteers. All of the families were recipients of food aid from the HMUMC Pantry, where they picked up much needed food, right next door to our makeshift gift headquarters. While there were gifts provided for nearly two hundred children, the volunteers were by far the most fortunate receivers of gifts. I won’t forget the gift of receiving a tight hug from a mother receiving a Bible her son could call his own. Warm tears on the back of my neck caused my own tears to flow. Smiling faces of young children visiting with Santa, and grateful smiles from parents provided me with the richest of all gifts on a chilly Saturday morning.